EKU senior, Jose Soto Hernandez from Louisville, brought home top prize in the 2012 International Graphic Arts Education Association (IGAEA) student poster design competition. Graphic communication and design programs worldwide compete for prestige and cash awards. 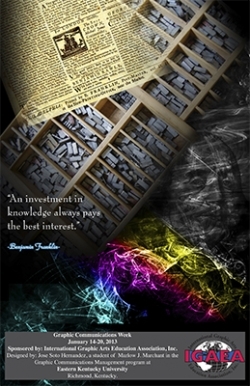 Posters are designed for Graphic Communications Week which typically revolves around Benjamin Franklin’s birthday on January 17. The theme can encompass anything that symbolizes the power and importance of printed communications. Jose is a partner in Dream Walker Social Marketing, a social media marketing company formed by EKU students housed in EKU's Business Accelerator. DreamWalker offers clients a personalized social media marketing experience while connecting businesses and professionals through digital media opportunities. Using this unique customized approach, DreamWalker has matured and plans to move into their first permanent quarters in Louisville.